This tutorial provides you with a foundation for working with Adobe InDesign spelling. It is the third lesson in the Adobe InDesign CC Digital Classroom book. For more Adobe InDesign training options, visit AGI’s InDesign Classes. Checking spelling is an important part of creating a professional-looking document, and InDesign has several options to help you prevent and correct spelling mistakes and simple typographical errors. The Dynamic Spelling and Autocorrect options alert you to misspelled words and can automatically change them for you. In this exercise, you will take a closer look at the ability to find and change words across an entire document or group of documents. InDesign can help you locate misspelled words, repeated words, uncapitalized words, and uncapitalized sentences. 1 In the Pages panel, double-click page 2 to center the page in the workspace. 2 Select the Type tool ( ) from the Tools panel, and then click anywhere in the headline at the top of page 2 that reads What is the next inovation in cell phones?. The word innovation is intentionally misspelled to help you gain an understanding of InDesign’s spell-checking capabilities. 3 Choose Edit > Spelling > Check Spelling. The Check Spelling dialog box appears. 4 Select Story from the Search drop-down menu at the bottom of the dialog box so that only this text frame is searched. A story is the InDesign term for a text frame and any other text frames that are linked to it. The Check Spelling dialog box is displayed. 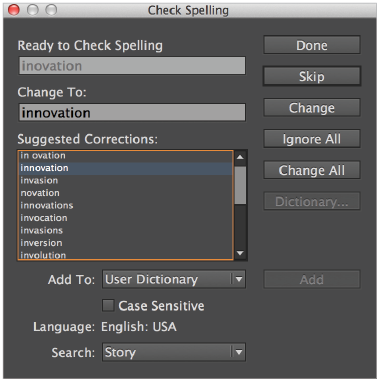 5 Inovation is displayed at the top of the Check Spelling dialog box under the Not in Dictionary category. The correctly spelled innovation appears in the Suggested Corrections field. Select the correct spelling, innovation, and then click Change. Because InDesign has completed spell-checking the story, the Start and Done buttons are both available. The Start button would recheck the story, while Done closes the Check Spelling dialog box. You can add words to the dictionary so they are not listed as incorrectly spelled, such as proper names, or business-specific terms that should be ignored when checking spelling. 1 Using the Type tool ( ), insert the cursor at the very beginning of the first paragraph at the top of page 2. 2 Choose Edit > Spelling > Check Spelling. 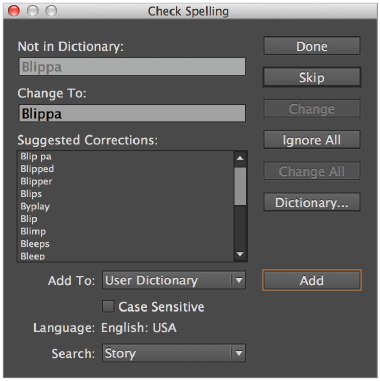 In the Not in Dictionary section, Blippa appears. This is the name of a new product that appears throughout this document. 3 Click Add to place Blippa in the user dictionary, and then click Done. Adding a word to the dictionary. You can add or remove words from your user dictionary by choosing Edit > Spelling > User Dictionary. You can add or remove individual words, or use the Import option to import a list of words to add to the dictionary. 4 Choose File > Save to save your work. You can create a central user dictionary to share with colleagues so that all workers in your office or team don’t need to create their own dictionary. To create and share a dictionary, choose Edit > Preferences > Dictionary (Windows), or InDesign > Preferences > Dictionary (Mac OS). Click the New User Dictionary button ( ). When the New User Dictionary dialog box appears, name the new dictionary. The location and name of the new dictionary file appear listed under the Language drop-down menu. After adding your commonly used words to the new dictionary, access the new dictionary file on another user’s InDesign program using the Add User Dictionary button ( ) in their Preferences > Dictionary dialog box and specifying the location of the user dictionary file that you created. InDesign’s Dynamic Spelling can help you avoid spelling errors by checking spelling as you type. Words not found in the InDesign dictionaries are marked with a red underline in your layout. If you use word processing applications such as Microsoft Word, this will look familiar to you. 1 Click the Pages button ( ) in the panel dock to open the Pages panel. Locate page 3 and double-click the page 3 icon to center the page in the workspace. 2 Using the Type tool ( ), click inside the text frame containing the headline When is the best time to update equpment? 3 Choose Edit > Spelling > Dynamic Spelling to activate the Dynamic Spelling feature. A red line appears under the word equpment. This may take a moment to occur, as InDesign will review the entire document once Dynamic Spelling is enabled. Accessing Dynamic Spelling through the Edit menu. Dynamic Spelling turned on. 4 Right-click (Windows) or Control+click (Mac OS) the word equpment. A list of suggested corrections appears in the contextual menu. 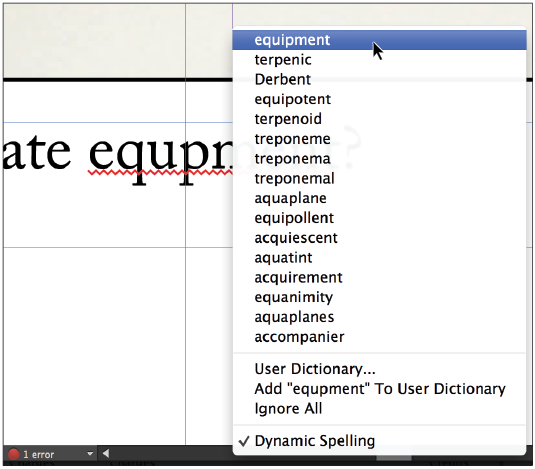 Choose the word equipment from the list, and the misspelled word is corrected. Replacing a word using Dynamic Spelling. 5 Disable Dynamic Spelling by choosing Edit > Spelling > Dynamic Spelling.